• Eliminates waste smoothly through the female mold. • Flat steel rules move through the rack to straighten. • Provides many sizes of Notching Die: e.g. 8 mm or 10 mm. • High quality structure, solid body, easy handling, and only use least force which provides good notch. • Cuts out different heights of Notch by simply adjusting the gauge on the left side. 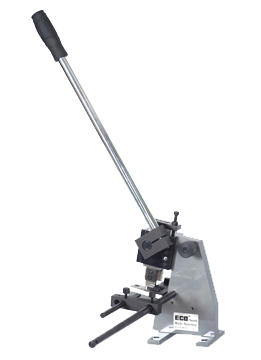 • Eco-Notch is a tooling instrument with the purpose of making notch for steel rules with high quality requirement. • Eco-Notch is suitable for Flat Bed Die Cutting rules/steel rules of the height of 23.8mm rule with the width of 1.5pt-3 pt. • The notch : max. depth 19mm(adjustable), standard width 6mm, other sizes on request. 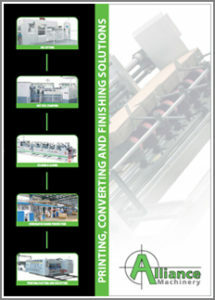 • Cleaning waste without any interruption. • Straight rules are held square by a support guide. • Alternative-size cutting tools can be supplied, e.g. 8mm or 10mm. • Accurately cutting tools ensure free notches with out distortion. • Different depth of notch can be obtained by simply adjusting the left gauge. • Eco-Notch is designed for the sole purpose of making notch for steel rules used for the die-cutting and creasing of paper, cardboard and corrugated board. • Eco-Notch is a manual device, and does not carry magnetic or electric requirements. • Eco-Notch is to be installed and operated in die-room at a suitable working table. • Eco-Notch is only suitable for the use of steel rules on the automatic or manual Flat Bed Die Cutting Rules, and not suitable for other types of steel rules onDie-Cutting Machine (e.g. Rotary Die-Cutting Machine). • Cuts out different heights of Notch by simply adjusting the gauge. 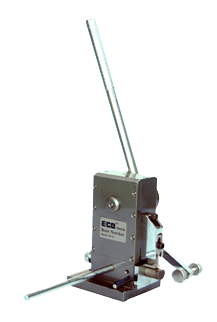 The Eco-Notch is a tooling instrument with purpose of making notch for steel rules with high quality requirement. • The Eco-Notch is suitable for Flat Bed Die Cutting rules/steel rules of the height of 23.8mm rule with the thickness of 1.5pt -3 pt. • The notch : max. depth 20mm(adjustable), standard width 5mm. • Air pressure : 7 bar. • Special designed machine body, ensuring different shape of steel rule can be notched. • The Eco-Notch is designed for the sole purpose of making notch for steel rules used for the die-cutting and creasing of paper, cardboard and corrugated board. • The Eco-Notch is a manual device, and does not carry magnetic or electric requirements. • The Eco-Notch is to be installed and operated in die-room at a suitable working table. • Straight cutting rule presses straight through a support sideway. • High quality structure, solid body, easy handling, and only use least force which can provide good notch. • Eco-Notch is a tooling instrument with purpose of making notch for steel rules with high quality requirement. • Eco-Notch is suitable for Flat Bed Die-Cutting rules/steel rules of the height of 23.8mm rule with the width of 1.5pt-3 pt. • The notch : max. depth 20mm(adjustable), standard width 6mm. • Large mechanical advantage enables thick rules to be notched with minimum effort. • Eco-Notch is only suitable for the use of steel rules on the automatic or manual Flat Bed Die Cutting Rules, and not suitable for other types of steel rules on Die-Cutting Machine (e.g. Rotary Die-Cutting Machine).